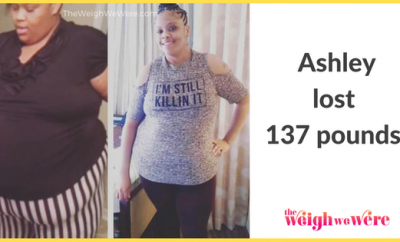 113 Pounds Lost: Change your inner monologue! I have been obese since I was a child. Food was always a reward, something to celebrate even the smallest moment. Everyone around me was obese. 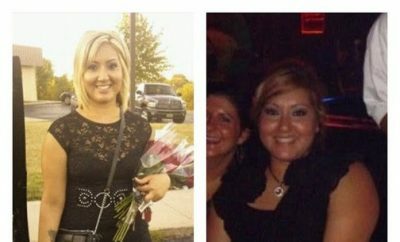 Looking back, my weight definitely limited my life. There were people I was interested in that would have never dated me. I was a wallflower in high school and just tried not to get noticed. I was made fun of fairly regularly. But it wasn’t just school. There are moments in my life that I wish I could repeat. Moments that I didn’t enjoy, or didn’t participate, for fear of calling attention to myself. I was an observer, not a participant. I actually spent most of my life believing that I was ‘supposed’ to be obese because all of my family was. I told myself it didn’t really affect anyone other than me (I am a married mom of two boys). We went on vacation to Europe and I tried to go on a roller coaster with my son. I didn’t fit in the seat. He was too short to ride and he got pulled off so no one knew but me. I knew something had to change, but it took me a couple of weeks to process what had happened. After reading “It Was Me All Along” by Andie Mitchell, something clicked. I realized that I had been sabotaging myself with negative thinking and I knew I could do it. But I had to actually do it. In the beginning, I calorie counted and walked for 30 minutes on my lunch break. I also joined a local “Biggest Loser” competition and was committed to that competition. I ended up winning! I started in September 2015, and in December 1015, I was able to get my wedding rings back on. That was the first time I noticed any change in myself. I actually spent most of my life believing that I was ‘supposed’ to be obese because all of my family was. No one in my family was physically active, so this isn’t something that was ever fostered. There is probably at least a weekly moment of weakness where I think to myself, “Well, this is it. This is the smallest you will ever be.” I think it is difficult to feel encouraged every moment of the day when you spend so long hating how you look. What keeps me motivated is the fact that I can do everything now. I can keep up with my husband, my kids, everyone. I don’t hold anyone back. Every time I do something physical, it reinforces the path that I am on. Every time I put clothing away that is now too big for me, it reinforces my path (I was a size 24-26 and now I am a size 12-14). 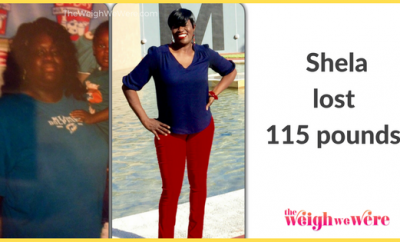 I have had periods where my weight seemed to stay the same for weeks. I just continued doing what I was doing, sometimes I would go out for a big meal and start again. Typically, for me, when I hit a plateau, it has to do with not being as consistent as I should be. Usually, I go back to the basics. Limit sodium, increase water, make sure to track everything. 16 months. My ultimate goal is to lose another 20-40 lb, but I don’t know where I am ‘supposed’ to be as I have been morbidly obese my entire life. I want to get as close as possible to a normal BMI (so for my height, under 150lb). The first time I flew after losing about half of the weight I have lost, I didn’t have to have a seatbelt extender. That was amazing. Not having to ask the flight attendant for that was surreal. I was always an emotional eater. Eating made me feel better. But I was also a ‘bored’ eater. I ate when there was nothing else to do. I ate a lot of fast food and convenience food. I would say that the vast majority of my meals had a convenience aspect to them. I did eat some veggies, but they were not a very big component of my diet. Now I cook most of my meals and approximately half of my plate is veggies. I still go out to eat from time to time, but it really is a special treat. Initially, I didn’t like working out. I was always hot and sweaty and that was always uncomfortable. Even then, I just walked on my lunch break. I still do this, but I have started jogging a bit. I completed my first 10k in September 2016 and plan to do a half-marathon in September 2017. I also use the elliptical machine in my home when it is raining or too cold to go outside. Pick small attainable goals. 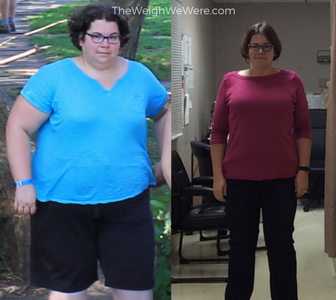 For me, I made a small goal (get my wedding rings back on), a medium goal (weigh less than my husband) and a big goal (get out of the “obese” BMI). I have thus far met the small and medium one, and I have about 11lb to go to meet my big goal. Fibre! I significantly increased the amount of fibre I eat and I feel fuller longer now. I don’t need to snack between meals. I had a hard time drinking enough water per day. I keep a huge 750ml cup at my desk and that makes it easier. I also started drinking herbal tea to add water to my day. You have to plan ahead. It sounds like a lot of work, but it really isn’t. Pack your lunch for work. Get a kitchen scale. I weigh everything…even the four chocolate chips I put on top of my muffin. Everything. It keeps me accountable because I really am not able to estimate by eyeball, even after all this time. 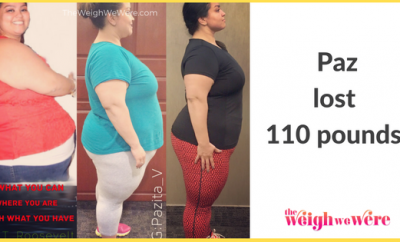 ← Previous Story 104 Pounds Lost: Fighting to get my life and body back!